The world never stands still, which, unsurprisingly, also applies to camping fundamentals. 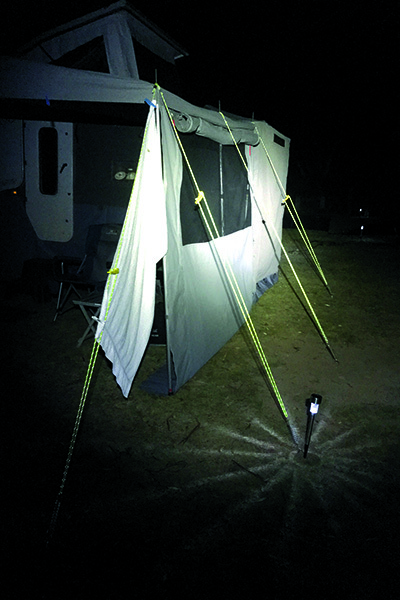 Google ‘camping innovation’ and up pops seemingly endless lists describing the latest in fancy pants, high-tech, super-lightweight, up-to-the-moment, latest fashion, hypercomponent whizzbangery for the hiking camper, typically for the American market. 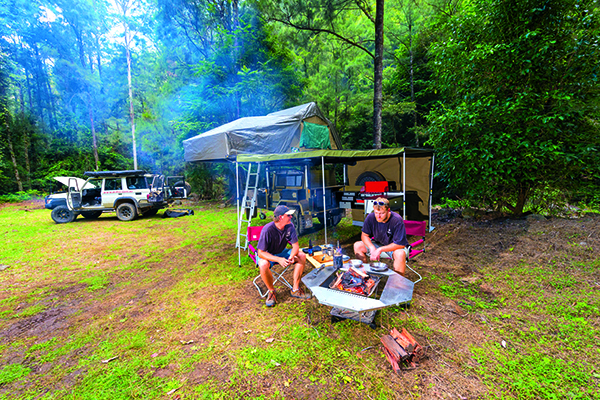 But here Down Under, with our unique take on things, there is still a steady flow of neat products and ideas that will make your camping experience a few steps better than last year’s adventures. In the ‘good old days’, camping involved a large and bulky canvas tent—usually with patches of mould prosperously eating its way through the waterproofing—complete with heavy wooden poles, saggy old ropes and with a bad leak in one corner; matched with a couple of wooden boxes of old saucepans, a kerosene lamp, a box of matches and a blunt hatchet. Today life can be a lot more comfortable, and it’s still camping—despite the derisive comments of your grandfather: “Ah, this isn’t camping. When I was a boy . . .” etc. You’re still out there in the fresh air, the bush, next to a river or a beach, under the desert stars at night, enjoying the far horizons and the wildlife, exploring the country. All those adjectival categories above do come into play to some degree, but few are hot off NASA’s drawing board, they’re simply good practical design that’s available from a wide range of sources, won’t cost you the sale of a kidney and will improve your camping experience. Let’s take a closer look at some. In a world cramped for room the Smartspace Saucepan Set has a lot of answers. The square shape means they fit side by side on small stove-tops, so you can use all burners at once. When not in use, they stack inside each other, minimising space requirements. All three pots have strong steel lids with steam vents and refrigeration seals so they can be used in the fridge to store leftovers. With a non-stick surface and made from quality aluminium, the set comes with internal silicon mats to prevent scuffing and damage in transit. There is a strong detachable handle that is quickly slotted onto each pot. Pot sizes are 1.4L, 1.9L and 2.8L. The walls are 3mm thick and the bases are impact bonded heat transfer and induction suitable. Widely available from many outlets, prices range from $185 to $209; with 12 months manufacturer’s warranty. Also available is a matching rectangular frypan and lid. The advent of small gas-fuelled cookers greatly enhanced the production of simple butane gas canisters, which has led to the development of clip-on appliances using the same fuel source. One of these is a small blowtorch. These are widely available online, from cooking or tool outlets and come with simple piezo ignition so are self-igniting, have adjustable flame intensity and will work at pretty much any angle. They are quite small and easily carried and while their biggest market appears to be in the culinary world, they are great for lighting campfires as they provide an intense flame, and has many other potential bush handyman uses. On those days when the wood is a bit damp, you’ll appreciate it. Prices are usually around $25. Forget about carrying a heavy hammer and sweating profusely clubbing steel pegs into the ground. 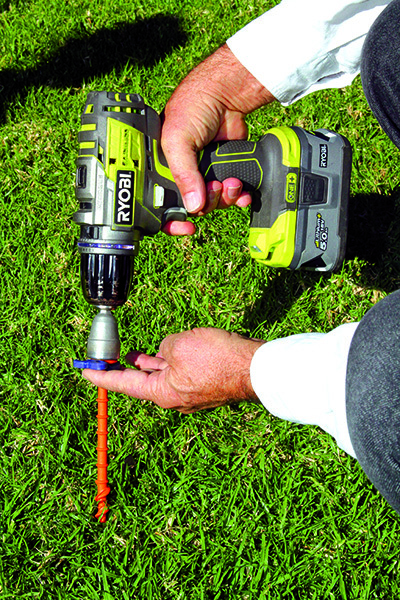 Now you can simply drive screw-in pegs with a cordless drill. Made from high impact plastic, these pegs are surprisingly strong and light and will find a firm anchor point in just about any ground. Simply back off the clutch mechanism in your drill and drive them home until the clutch starts to slip. If your drill won’t drive them in further then they won’t pull out either. Lower the anchoring collar to ground level and you’re ready to hook them up to your awning ropes. Removing them is simply a matter of reversing the above, and you don’t have to struggle in hard ground. There are cheap Chinese knock-offs appearing on the market at about $1 to $2 each, but quality German units such as from Peggy Peg are preferred. They come in kits or individually in a variety of sizes. The disposal of grey water is becoming an ever greater issue in camping. The capture of wastewater and its transportation to a suitable disposal point is a ongoing concern for many campers. One solution is the Fiamma Roll-Tank, which comes in two sizes: 23 and 40 litres. They come with wheels for easy transport, a grip handle and an extendable roll handle, with a total discharge cap for easy emptying. The larger unit has a level indicator, an air bleed valve and a 45 degree angle adapter to assist in emptying. The weight when empty is 3kg/3.5kg. 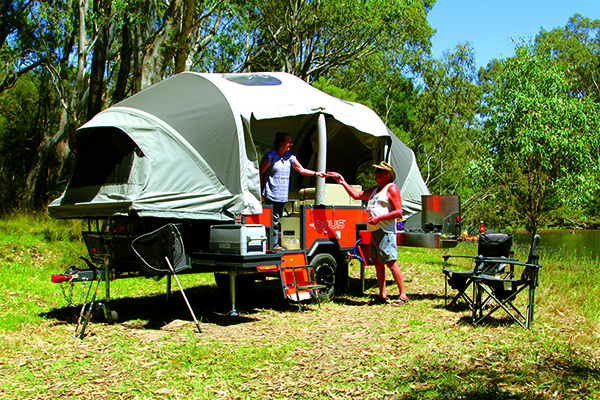 Widely available from major caravan equipment outlets, with prices from around $85 for the 23L unit and $179 for the 40L unit. You’d think that levelling ramps are what they are and how could you improve upon their functionality? However, the new Andersen curved levelling ramps offer more efficient and precise levelling and are much easier to chock. The Andersen Camper Leveller enables levelling at any increment between 12mm and 100mm, while the Rapid Jack enables lifts up to 150mm. You simply place the smaller end under the leading edge of the tyre and tow or push the trailer on, with the ramp wrapping around the tyre as it goes. When the desired level of lift is achieved simply place a chock behind the back end and you are there, without worry about the camper rolling forward or back off the ramp. 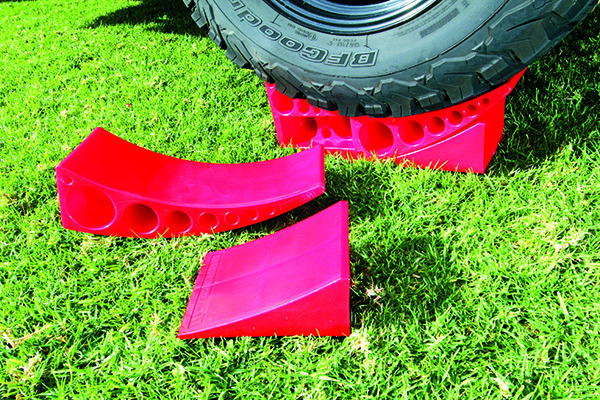 They are also of value at home to place under the camper tyres during storage to prevent the formation of flat spots. Of sturdy construction they can support vehicles up to 13,500kg in weight and are useful as wheel chocks or pad blocks for stabiliser legs. 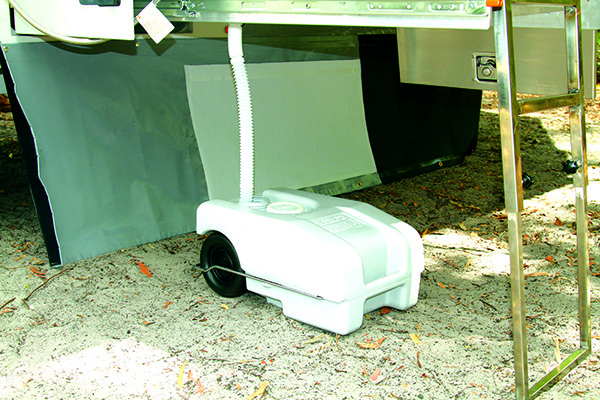 RRP is $79.95 per ramp and chock for the Camper Leveller and $99 plus $15 for a matching chock for the Rapid Jack. Suitable for tyres up to 813mm in diameter. Sick of tripping over awning guy ropes in the dark? You only have to do it once to decide this is not a good thing. Now available from your friendly local hardware chain is reflective rope. Featuring abrasion-resistant braided construction with a reflective tracer incorporated within, with a breaking strength of 180kg, this 6mm rope is ideal for camping. There are other smaller gauge ropes being sold for this purpose, but they would be too light for camper trailer purposes. Available in 30 metre lengths for just $14. 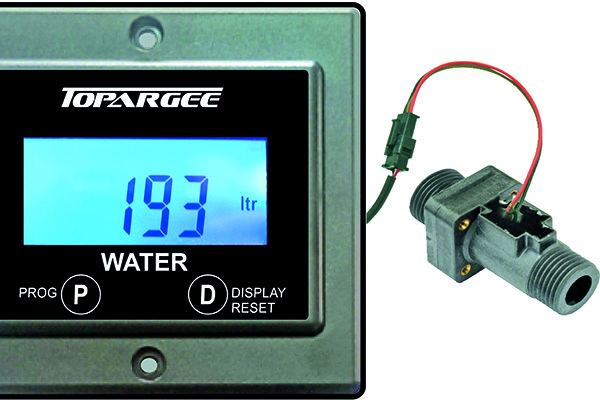 Water tank gauges that indicate whether a tank is full, three-quarters, half, quarter full or empty have been around for yonks, but the Topargee Water Gauge can actually gives you readout on how many litres you have left. There are no fittings within your water tank(s), only a flow meter which is installed in the water line from your tank(s) on the pressure side of the pump. You calibrate the gauge to suit your camper’s tank volume and it then monitors water flow from the pump, in either litres or gallons. The recommended retail is $129 for the 12V hard wired version or $95 for the battery powered version. If you’ve ever removed the mattress from your camper, likely you’ve occasionally found it damp and, if it’s been a while since you last aired it, a bit smelly. This is moisture from your body, and it will get into the base board beneath the bedding. To eliminate this problem you can fit Aero-Mesh. 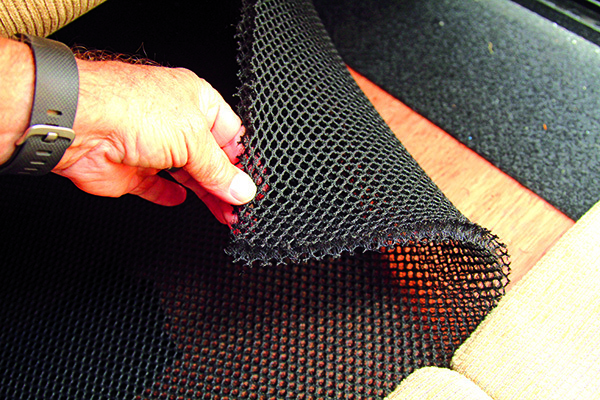 This is a 10mm thick non-woollen, non-organic spring-like mesh material designed to permit air to circulate beneath your foam or inner-spring mattress. It improves comfort as well as moisture problems, weighs next to nothing and comes in all standard bed sizes or in large rolls, and has a variety of other uses as well. Available from a wide range of outlets. 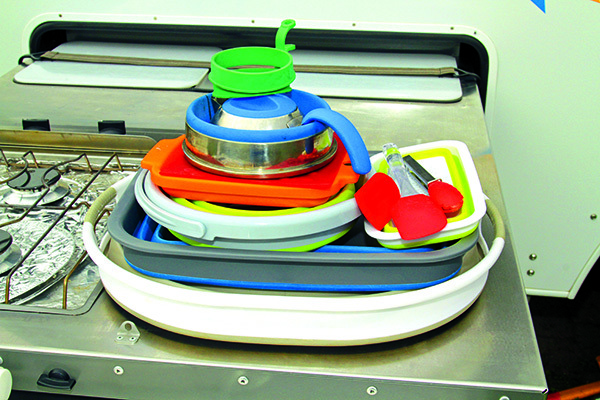 There was a time when you went camping without such things as a colander, a baking tray, clothes basket, salad bowl or dish drainer, mainly because they were too bulky, but the advent of soft and flexible silicone kitchenware has not only made these practical items to carry but also reduced the weight of what we carry. Silicone kitchen items range from the very popular collapsible ovens and kettles to all manner of small (tongs, spoons, pot holders, moulds, spatulas., etc) and large items to awkwardly shaped products, such as funnels, biscuit trays, strainers, baskets, saucepans and more. 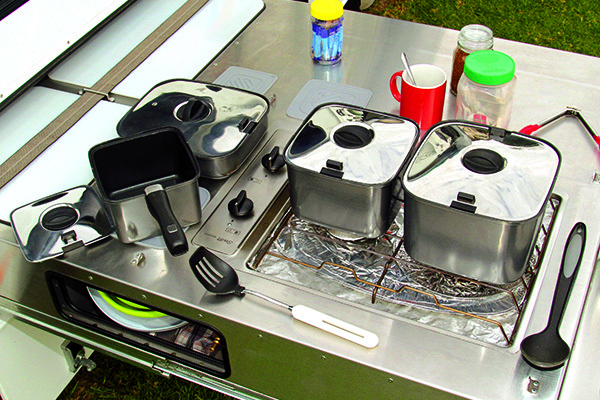 They can be bent, folded and crammed into small spaces and their negligible weight and bright colours have done much to brighten the kitchens of campers around the nation. Let your imagination run riot. The days of building a fireplace in the bush from random rocks lying about are still with us in places, but anywhere where a manicured lawn requires us to keep flame contained, and while you can maybe make up a simple oven out of a 9kg gas cylinder, you can’t beat the convenience and professionalism of something like a Snow Peak fireplace. 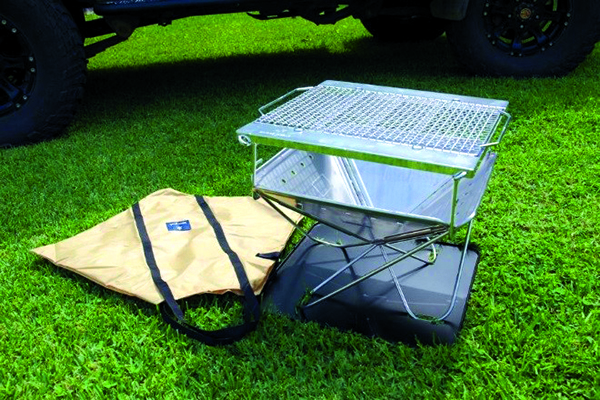 The good thing about a Snow Peak is that it folds down flat into a carry bag, is made from 316 stainless steel and weighs as little as 3.2kg or up to 10kg if you want the large model with the base plate to protect the ground and the grill bridge and the cooking net. You can cook on them, they’re big enough to make a cosy camp fire and there’s a long list of optional extras. Prices start from $175. It seems that nothing is free from innovation, and the rage in the hiking tent market for inflatable tents has now reached camper trailers, with one manufacturer – Opus – offering its new Opus Air model at shows earlier this year. 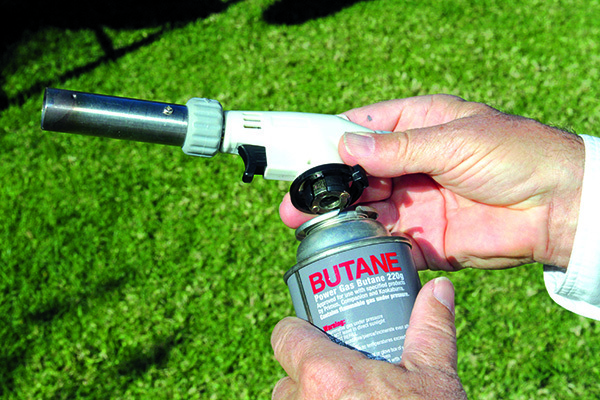 The advantage with a camper trailer is that you carry your own batteries, so inflation is a matter of throwing a switch and 90 seconds later you have a tent erected over your heads. The six-berth doublefold camper then becomes your cosy home for as long as you need it and packing away simply means opening a valve to permit the air poles to deflate. It’s light, quick and easy. How it would stand up to one of those wild summer storms is unknown, but the hiking fraternity think they’re just great and it has already won a number of awards and plaudits overseas. At $27,490 they’re not out of the park price-wise. 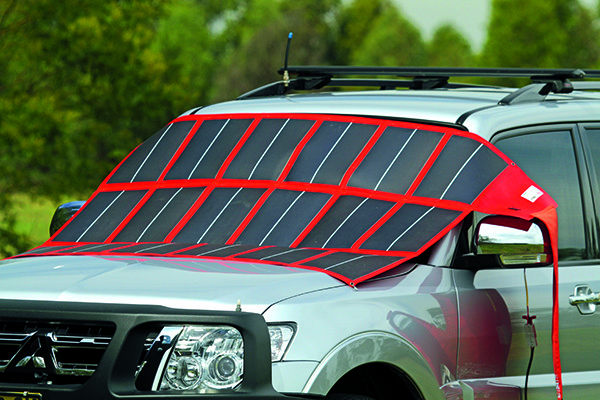 Solar is pretty universal on and around camper trailers today, but why carry big heavy glass fronted panels when you can carry a lightweight fold-up solar blanket? There are a number on the market, ranging in capacity up to Projecta’s 120 watt unit (RRP $699) on down to quite small outputs. They are generally quite light (the Projecta at 6.4kg is amongst the heaviest), are soft edged, so don’t damage other components or the carrying vehicle, fold up into smallish packages and not likely to be easily broken. In fact Redarc even claims that its 108 watt blanket can be walked on without a problem. The biggest hurdle is price, with Redarc’s amorphous blanket at $2295 being by far the most expensive, but others are commonly around the $600 price range.